Welcome to the part of the website that is especially for the Club's junior players. The junior organiser is Roy Wilson. He has been DBS checked so cleared to work with junior golfers. He is the first point of contact if you want to know anything about being a junior player at Warkworth. He can be contacted via the clubhouse or you can email him on rdw24333@gmail.com. NOTICE BOARD - there is a notice-board devoted to junior members in the foyer adjacent to the first tee. Entry sheets for junior competitions are posted here. 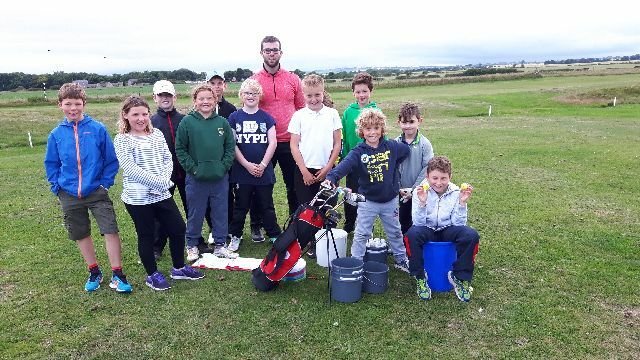 JUNIOR COACHING - the Club arranges coaching for junior members from a PGA professional. This is free and clubs and balls are provided, if needed. Dates for coaching in 2019 are: (all Mondays) May 13 & 20, June 3, July 29 and August 12 & 19. Beginners from 6.00-7.00 and improvers from 7.00-8.00. HANDICAPS - all juniors are given a handicap which is maintained and updated by the Match Secretary. Members who have nominated another club as their 'home' use that handicap in Warkworth competitions. A boy achieving a handicap of 28 or less and a girl with 36 or less becomes eligible to play in full adult competitions. The competition entry sheet goes up on the junior notice board a couple of weeks before the event. Competitions are open to both boys and girls.